Solar and wind energy can both contribute significantly to the domestic energy needs of yachts. They can power interior lighting, radios, navigation instruments and water pumps - or can simply be used to keep batteries in good condition when the boat is laid up. A lot of thought has to be given to the installation. Quite apart from the corrosive effects of salt spray, and the fact that everything is thrown all over the place all the time, space is often at a premium on a yacht! No-one wants a big panel creating a lot of windage, or a turbine placed where the rapidly spinning blades could catch a rope, or worse, someone's head or limbs. Our flexible solar panel range can be gently flexed and glued down to the curve of a deck or coachhouse, as long as the curvature is not too great. They use high-efficiency cells, so take up the minimum space possible - an important factor on a boat. They are great for keeping your battery topped up while you are away, although they are not powerful enough to run lights, radios and navigation equipment on a daily basis. Simply glue the panels down with a marine-grade adhesive such as Sikaflex, or screw down using the four grommet holes in the corners. Alternatively, the FlexiSun range of solar panels is a more powerful and high quality, semi-flexible, marine solar panel for yachts, that can be screwed or glued down flush to a suitable surface. The modules are maintenance-free, durable, and weatherproof. At only 4mm thick, they make little impact on the available space on a yacht and can be walked on in even in wet weather. Many people do still use glass-framed panels on boats, and where there is a suitable place to mount them out of harm's way, they can be very effective. The Victron range are made by one of the longest-established manufacturers of solar related products, yet remain very good value. 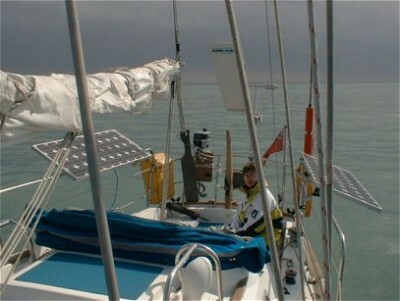 Also our Panasonic panels are also suitable for marine use. Wind is rarely lacking in coastal areas, so turbines can also be a very effective means of generating electricity on yachts. Care does have to be taken in finding a suitable mounting position - the rapidly spinning vanes can be dangerous - normally, a short mast on a pushpit is chosen as the best location. Rutland produce two of the most popular turbines for the marine market: The Rutland 504 is their smallest turbine, designed for keeping batteries topped up, while the larger Rutland 914i can produce enough electricity to meet the domestic needs of most yachts.